The German capital is a thriving metropolitan city, but take the time to peek behind the curtains and you’ll a wealth of history waiting to be uncovered. From the famous Brandenburg Gate to the laid-back Beer Gardens, and from monuments of the Second World War to Berlin’s new TV Tower, the city is filled with historical and cultural sites. While the city of Berlin often calls to mind a darker era of the 20th century, a time when its streets were occupied by Nazi soldiers under the rule of the Third Reich, the origins of the German Capital go much deeper. Fortunately, there is a range of city tours to choose from, so you can learn about the city on foot, by Segway, or perhaps in a convoy of classic Trabant cars. For history buffs, there are few better cities to see such a range of historical sites. For artists and architects, Berlin hosts a mixture of communist buildings, decorative baroque facades, and controversial street art. For youngsters Belin has a buzzing nightlife and open-all-night clubs, while for seniors there are plenty of traditional beer taverns to while away an evening. 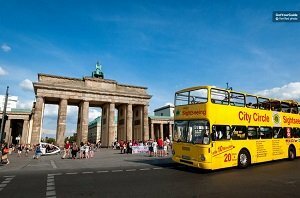 To help you discover the city at your own pace Berlin brings you the double-decker city sightseeing bus, complete with an audio guide or live commentary. The city also has an excellent public transport system with full disabled access and multi-day transport passes. Alternatively, you might opt to see the German Capital by boat on a laid-back river cruise. An easy to use and convenient public transport pass for exploring the German Capital. A hassle-free and money-saving ticket. 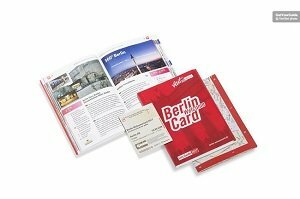 Use the Berlin Welcome Card to travel in zones AB or ABC of the city. Simplify your holiday with just one ticket for all modes of transport. Take advantage of special offers and discounts across the city. Unlimited use of Berlin's public transport. 1 to 6-day travel pass. The Berlin Welcome Card has been highly recommended by Get Your Guide and Viator users. The majority of reviews are 5 out of 5-stars. Travellers say free access to public transport is very useful and that the public transport in Berlin is easy to understand. If you're someone who wants to see a lot of the city and use public transport rather than pre-organised tours then this is the tour for you. Berlin's public transport is also convenient for wheelchair users. A chance to see a major European city from the comfort of a 1-hour river cruise. A laid back sightseeing experience in the heart of Berlin. Board a charming German river boat and cruise on through the centre of Berlin. See some of the city's famous landmarks. Be entertained by panoramic views and on onboard audio guide. Overall this is tour highly recommended by previous customers. Travellers will tell you that this is a calm and easy way to see some of Berlin. This tour has a 4 to 4.5 average score. Great for people on their first visit to Berlin. You will get to see significant city landmarks and learn a little about the city. A flexible city bus tour with the company of a live onboard guide. A Hop-On Hop-Off city tour with a more personal feel. Discover the city centre of Berlin with a live English-speaking guide. Enjoy a flexible city tour. Hop-on or off at any of the 19 stops around the city. This is a popular alternative to the usual Hop-On Hop-Off bus tour which has an audio guide. Travellers say that they enjoyed the company of a live guide who was witty and knowledgeable. The tour has a good 4.4-star rating. If you prefer a live commentary to an audio guide then this is the bus tour for you. Suitable for adults, children and disabled visitors. A casual sightseeing trip on Berlin's scenic river. A chance to get to know East Side Berlin. Cruise along the River Spree towers the eastern edges of the German Capital. Learn about the city's key features from a multi-lingual audio guide. See some of Berlin's famous sights from a comfortable river boat. Travellers say then this is a very enjoyable cruise. Comments specifically say that this tour will bring you closer to some of the lesser-known districts of Berlin. The tour has a recommendable 4.5 out of 5 from Get Your Guide users. This tour is aimed at visitors who want a laid back sightseeing trip. Great for travellers who specifically want to see the sight of East Side Germany. A flexibly city bus tour of central Berlin. The Hop-On Hop-Off sightseeing bus gives you the convenience of a city tour with the flexibility to choose your own itinerary. 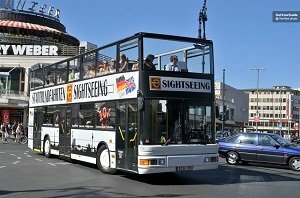 See the most important sights in Berlin from the open top deck of your sightseeing bus. Learn about Berlin, past and present, with a complimentary audio guide. Hop-on or off at your chosen stop. Hop-On Hop-Off 24 or 48-hour ticket. Travellers say that this is a convenient way to see the city. The Hop-On Hop-Off tour is highly recommended. Comments agree that the audio guide is very informative. This is aimed at visitors who would like a flexible city tour. This should appeal to independent travellers but also to families as the bus will stop as a wide variety of attractions. A super fun and futuristic way to see the city centre of Berlin. 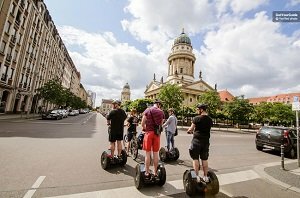 Berlin Segway tour is a fast-paced alternative to a standard walking tour. Ride through the centre of Berlin making stops at the city's most important sights. Let your guide take you through Berlin's streets and teach you about the city. Hear about 20th century Germany and get some handy tips from your local guide. Travellers say that the Segway tour will take you to all the important places in the city. The tour is a bestseller with 5-star ratings on Viator. Reviews frequently talk about the fantastic guides and fun tour. Great for active travellers who want an exciting and fun way to explore the city. Fun for friends, families or individuals. An opportunity to experience an incredible show created by some of the best choreographers, designers and performers in the arts. See the highest rated performance in all of Berlin. See a unique and extravagant show. Travellers have described The ONE Grand Show as ‘the best show I have ever seen'. Comments generally agree that the show is very entertaining and with excellent visual effects. If you enjoy contemporary theatre then this show is for you. The ONE Grand Show is one of the greatest displays of modern and artistic talent. A chance to get behind the wheel of Berlin's best-loved car. A city tour through the east and west sides of Berlin with an expert local guide. 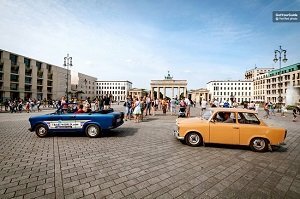 Drive your very own Trabant car through the central streets of Berlin. Follow the convoy and learn about the city from your guide. Enjoy the experience with your family or friends. Travellers have described the Trabi Safari as a ‘stunning adventure' and a ‘one off experience'. The tour has 5-star reviews on Viator and 4.8 out of 5 on Get Your Guide. This is for people who want a unique semi-guided tour. Ideal for small groups and families as you'll have your own car. The TV Tower is one of the most popular Berlin attractions and this ticket gets you priority access to the tower's elevator. 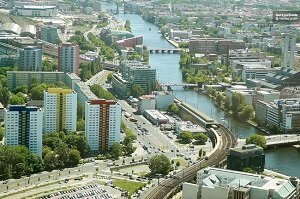 A chance to see Berlin's most famous landmarks, the Brandenburg Gate, the River Spree and more, from above. Speed to the top of Berlin's TV Tower and enjoy the best panoramic views the city has to offer. Save time with skip the line entrance to the tower. Travellers say that the pass gives you very quick entrance to the tower. This ticket has mostly 4 and 5-star reviews. Right for people with a head for heights. A detailed tour which explored the history and events of Berlin right up the 21st century. A historical city walking tour with local guide. Learn about Berlin during wartime Germany. Hear about the times of division and the end of the Berlin Wall. Get to know the modern city of Berlin. They will tell you that this is a fantastic way to learn about the history of Berlin. The tour has an overwhelming number of 5-star reviews from travellers. Traveller reviews highly recommend this Berlin walking tour. Right for visitors interested in the recent history of Berlin. Great for people who want a specialised history tour which veers off the beaten track. A fast and fun bike tour though the city centre of Berlin. A chance to learn about the city, both east and west sides, from an expert local guide. Whizz through the German capital on two wheels. Visit the main sights of the city and head away from the crowds to see hidden parts of the city. Travellers say that this is a great idea for seeing the city. Comments have said that the tour is fun, fast-paced and informative. 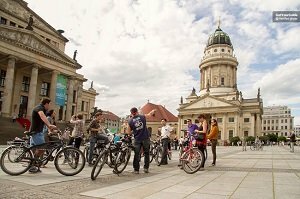 Berlin Bike tour has 4.8 to 5 out of 5-star reviews. Suitable for mixed levels of fitness. If you can ride a bike and fancy an active sightseeing tour then the Berlin Bike Tour is right for you. An insight into the horrors which occurred under the dictatorship of Adolf Hitler. 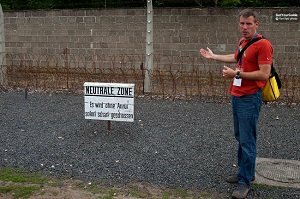 This tour takes you into an authentic concentration camp where thousands of people lost their lives. Visit the former camp where so many imprisoned and killed during the early 20th century. See the remaining buildings and learn what each was used for. Hear about the Nazi ideology and the Third Reich. Travellers have described this tour as a fantastic and informative experience. The tour has 5-star ratings on Viator. Comments agree that tour guides are both honest and sensitive. This is for people who want to fully understand the events of the Holocaust. Right for adults and older children. This is a trip back in time to the period between 1933 and 1945. A journey into Nazi Germany with a qualified historian guide. Take a 3.5-hour walking tour of the city centre. Listen to the stories of Germany during the Third Reich. Visit monuments and significant buildings in the city. This tour is highly recommended. There are many 5-star reviews on TripAdvisor, Viator and Get Your Guide for this tour. Travellers will tell you that it is the local guides who bring the tour to life. Aimed at visitors who are interesting in 20th century history and the social dynamic of Germany during that time. A fine dining experience atop the famous Berlin TV Tower. The best located restaurant that you will find in the entire German Capital. Enjoy a delicious dinner with the finest view in all of Berlin. Sip glasses of excellent wine and share a wonderful dining experience with your travel companions. Glass of sparkling wine x 1. Glass of white or red wine x 2. Travellers have described the experience as ‘faultless'. 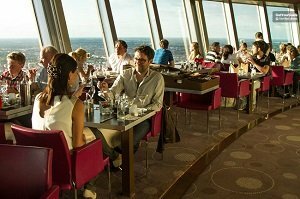 The Berlin TV Tower Dining Experience has received hundreds of positive reviews from customers. This ticket has 4.5-star ratings on TripAdvisor, Viator and Get Your Guide. If you fancy a unique dining experience then this ticket is perfect for you. A romantic option for couples. Something fun and sociable for friends and families. This is a comprehensive city walking tour which is aimed at showing visitors how it was to live in divided post-war Berlin. An introduction to the German Capital and it's most famous monuments. Visit the Berlin Wall Memorial. Hear the stories of both East and West side Berlin. Pass through Checkpoint Charlie and stop at city landmarks. Travellers will tell you that this tour is led by amazing tour guides. Comments agree that the Cold War Walking Tour is very interesting and informative. The tour has overall 5-star ratings. 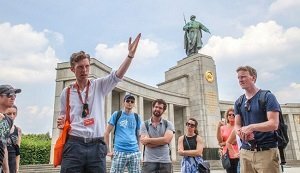 If you're are interested in 20th century history and interested in the effect of the Cold War in Berlin then this tour is right for you. This is a predominantly historic tour. The highlight of Berlin’s museum Island and the most extensive collection of Eastern artefacts in Germany. This is convenient skip the line entrance ticket which can save you hours of queueing to visit this popular attraction. 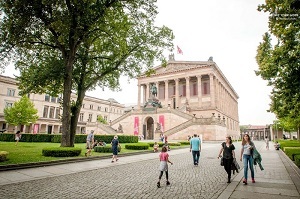 Take a self-guided tour of the Pergamon Museum and discover a world of art and exhibits from another time era. 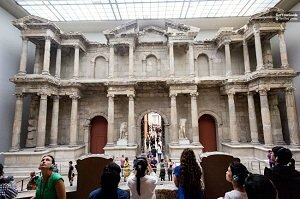 Learn about the artefacts hosted in the Pergamon Museum with a multilingual audio guide. See the colourful façade of the Mshatta Palace, the Ishtar Gate and the Procession Way from Babylon. Fast track entrance to the Pergamon Museum. They generally agree that the museum has hosts an amazing number of interesting exhibits and artworks. Travellers generally seem to agree that pre-booking the entrance ticket and going fast-track is worthwhile. The Pergamon has excellent reviews from Trip Advisor users. Right for people with an appreciation for ancient art and eastern culture. A must see for historians, art lovers and people who want to learn about mediaeval civilisations. 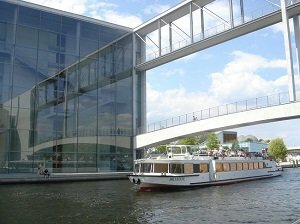 This is a relaxing and interesting half-day excursion from the German Capital to one of the most interesting cities in northern Germany. Potsdam is a charming city filled with historic features and UNESCO protected green spaces. The city once hosted royalty as well as Dutch communities and a Russian Colony. 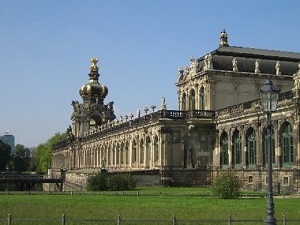 Take a comfortable air-conditioned coach from the Berlin city centre to the city of Potsdam. 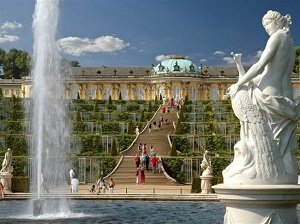 Visit the famous Sanssouci Palace and its beautiful gardens. Stroll between fig trees and grape vines and pass by gorgeous fountains. Enjoy the company of an excellent bilingual tour guide and tour the Palace with a multilingual audio guide. Entrance to the Sanssouci Palace. Travellers have left very positive reviews for this half-day trip from Berlin. 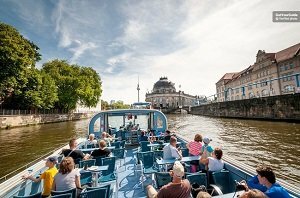 Comments generally agree that the excursion is excellent value for money and that it provides a good introduction to the city of Potsdam. Right for anyone interested in cultural heritage and historic architecture. This tour should also appeal to people who would like a day away from the busy German Capital. The museum exhibits items and artifacts relating to the Cold War of the 20th century. Its premises used to be the place where escapes from East Berlin were planned. Berlin Wall Museum displays various interesting exhibits, including a submarine and an airplane. Acquaint yourself with the history of Berlin, Europe, and the world from the early 1960s to the beginning of the 1990s. Find out how people planned to escape from East Berlin, held by the Warsaw Pact troops, to West Berlin, controlled by the NATO. Learn stories of sacrifice, enterprise and bravery. Ticket to the Museum of Berlin Wall. "This is a must when visiting Berlin." "Lots of great stuff in the museum." "Would highly recommend the visit." Visit to the museum is highly recommended for history buffs. 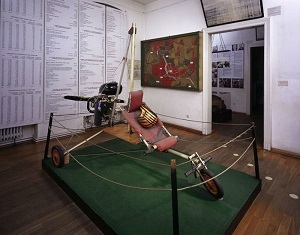 The museum is suitable for children, especially those over 10, and adults alike. The tour highlights some of the top attractions of the city of Berlin. The activity takes participants on the history tour of the German capital. Travelers also learn what prominent people visited and lived in Berlin, with JFK, Einstein and Marlene Dietrich among them. See some of the leading attractions of Berlin, such as the Brandenburg Gate, Reichstag and the Berlin Cathedral. Learn about the city's Nazi, Cold War and Imperial pasts. 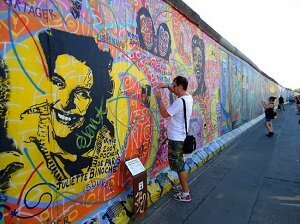 Visit the remains of the Berlin Wall hear stories about famous Berliners, such as Albert Einstein. Professional and certified guide leads the guided tour. Travelers receive a free map with various points of interest. "Great walking tour around Berlin." "Our tour guide was fantastic." "Very informative and enjoyable walk." 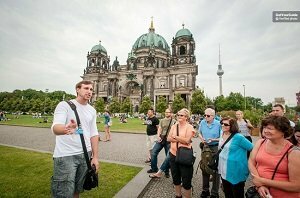 The tour offers a great value to every visitor of Berlin. The activity is especially recommended to travelers in the early stage of their stay in the German capital. The guided tour is suitable for people of different ages and interests. The combo ticket that allows its holders to circumvent long queues at two of the top attractions of the German capital. Madame Tussauds is a museum of wax figures, allowing visitors to get personal with their role models. 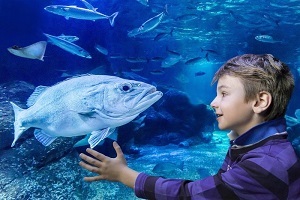 AquaDom & SEA LIFE exhibits a wide array of aquatic species. Examine rays, sharks and octopuses at the SEA LIFE. Enjoy a ride in a transparent glass elevator surrounded by schools of colorful fish at the AquaDom. Take photos with your favorite celebrities from films and sports at the Madame Tussauds. Priority entry to both related attractions. "It is very interesting to see everything"
"It is worth booking the ticket." The combo ticket grants a great time to people yearning for fun. Travelers interested in the marine world should visit the AquaDom & SEA LIFE. Both attractions are suitable for children and adults. This activity is a day trip from Berlin to Dresden, one of the most beautiful German cities. After a guided tour of Dresden's top attractions, travelers have time to enjoy the city at their leisure. The "Florence on the Elbe" boasts amazing Baroque architecture and sprawling green oases. Admire the beautiful architecture of the Frauenkirche, Zwinger, Semperopera and other attractions and landmarks. Walk along the River Elbe and explore the city's sprawling parks. Hear stories about the Meissen porcelain, a trademark of Dresden and Saxony, and learn the turbulent history of one of the most beautiful cities in Germany. Assistance by an expert local guide. Transport by a private coach. "It is a must see place for everyone." "Enjoying the city walk so much, and the views as well." "I strongly recommend this trip to everybody." If you are fan of arts, crafts and culture, don't miss the day trip to Dresden. Travelers interested in history are also highly recommended to book the guided tour. Passionate photographers will find an abundance of opportunities to make postcard-quality photos in the city and of the city. A scary journey through the Berlin past that is about 800 years long. The introduction of some of the city's most notorious residents in an unsettling environment. Priority entry allows visitors to circumvent long queues. Familiarize yourself with the dark past of the present capital of Germany. Encounter murderers, cannibals and ghosts as you learn the 800-year long history of Berlin. Experience special effects and a free fall into unknown. Admission fee and fast-track entry to the Berlin Dungeon. "Great actors and so much laughing and screaming!" "Went straight in with priority access." A visit to the Berlin Dungeon is the right thing for adventurers in heart. 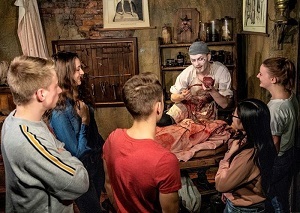 The tour of the dungeon proves entertaining for visitors inclined to mystery. Travelers interested in the lesser-known history of Berlin should consider securing the ticket.